A manufacturer of car parts wants to test the surface of his produced brake discs as exactly as possible for roundness, radius and surface quality. In order to allow precise rework and corrections of the process parameters, the measurement device must be able to transfer a consistent data set of the position value and the measured value to the control unit. 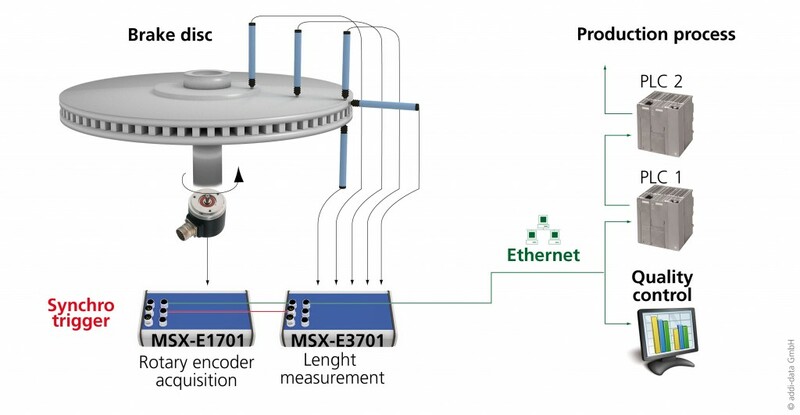 For this application, two intelligent Ethernet systems are used: The MSX-E1701 counter system for the position acquisition and the MSX-E3701 length measurement system for the detection of the measurement values through the connected displacement transducers. For each measurement point, the MSX-E1701 system triggers the MSX-E3701 system angle-dependently. For a precise matching of position and measurement values at each measurement point, both systems are synchronised and have a time stamp. The acquired data is then transferred through Ethernet to a PC or a PLC for evaluation and regulation purposes. Exceeded tolerance values are forwarded to the super-ordinate machine in order to adjust process parameters or to effect corrections on the measured brake disc.